If you’ve been listening to the news lately, you know that President Trump’s 25% tariff on foreign steel has caused a similar increase in the price of domestic steel. That’s just basic economics. Now that foreign steel costs more, domestic steel can sell for a fair price. And most businesses have to pass the cost increase along to their customers — that’s basic economics, too. 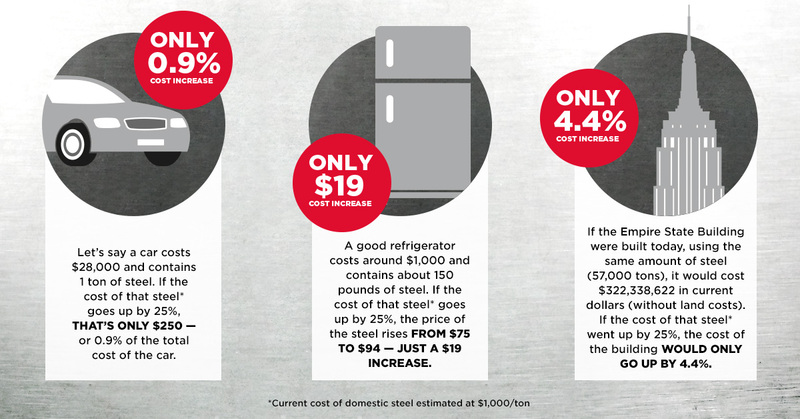 Some critics have expressed concern over the increased cost of goods containing domestic steel, but it’s important to understand just how small the increase actually is. Just take a look at the numbers below. In the grand scheme of things, the increases are nominal — but their impact on local communities can be huge. Just a few dollars go a long way in supporting our fellow Americans who work in domestic manufacturing jobs. That’s why more and more American businesses #ChooseAmericanMetal.